The Food and Drug Administration (FDA) issued a statement April 17 that discourages surgeons from performing a common gynecological procedure because it poses a risk of spreading undetected cancerous tissues. Kristina Adams Waldorf is a UW Medicine surgeon board-certified in obstetrics and gynecology. She described the procedure and discussed why it is used, and commented on the risks outlined by the FDA. Q. What’s the procedure and why is it used? "The FDA warning is a good time to reevaluate our practice as a group," said Dr. Kristina Adams Waldorf, a surgeon specializing in OB/Gyn conditions. "The FDA warning is a good time to reevaluate our practice as a group," said UW Medicine surgeon Kristina Adams Waldorf. A. The procedure is called morcellation. It is often used when the uterus is enlarged and the goal is to perform a minimally invasive hysterectomy or removal of fibroids. The surgical instrument shreds the uterine tissue or fibroids into long strips that can be removed through small incisions in the abdomen. In many cases with an enlarged uterus due to fibroids, this is the only way to accomplish a minimally invasive hysterectomy, with a few small incisions. The alternative would be to perform a hysterectomy through a larger “bikini-cut” incision, resulting in a longer hospital stay and recovery. Q. And the less-invasive surgery is typically patients’ preference? A. In the last 10 years, there has been a major shift nationally toward performing minimally invasive hysterectomies either by laparoscopy or with the aid of a robot to reduce blood loss, hospital stay and postoperative pain. Morcellation has allowed thousands of women in the United States to have a minimally invasive surgery. Q. What’s the FDA’s concern with morcellation? A. Morcellation results in the microscopic spread of pieces of uterine tissue into the abdomen. If the uterine tissue is normal, this is not a concern. The FDA estimates that one in 350 women who undergo morcellation have an unsuspected form of uterine cancer. At UW Medicine, our standard practice is to perform an endometrial biopsy before proceeding with a minimally invasive hysterectomy in which morcellation might be performed. The biopsy would catch nearly all endometrial cancers inside the canal of the uterus, but might not catch a more deeply embedded cancer in the uterine muscle, like a sarcoma. Morcellation could spread this cancer into the abdomen. This is a very rare situation but it could be a nightmare for the patient involved. Q. If cancer is detected in a biopsy, does that make the decision for the patient – for conventional abdominal surgery? Dr. Kristina Adams Waldorf talks with a patient at UW Medical Center. A. At this point, the general obstetrician-gynecologist would refer the patient to a gynecologic cancer specialist. In most cases, surgery would be performed with removal of the uterus intact and sampling of lymph nodes and other tissues. Morcellation would not be considered. Q. Could you ballpark the percentages of minimally invasive and abdominal hysterectomies? A. Here we perform minimally invasive hysterectomies through a variety of approaches (vaginal, laparoscopic, laparoscopic-assisted vaginal, robotic-assisted laparoscopic). I’d estimate that we perform a traditional abdominal hysterectomy 20% or less of the time. We also receive referrals from gynecologists in the community for complicated cases in which a minimally invasive hysterectomy isn’t an option. Q. 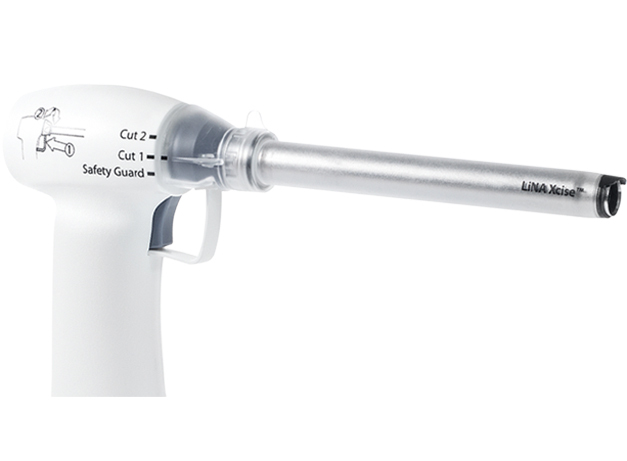 Will your group of practitioners rethink the safety of morcellation? A. The FDA warning is a good time to reevaluate our practice as a group. A minimally invasive hysterectomy enabled through uterine morcellation has been excellent for the vast majority of patients due to the faster recovery. A very, very small percentage of patients are negatively affected by morcellation. Q. How will you talk with patients about this? A. At the preoperative visit, my goal is to present the risks and benefits clearly so that the patient has the information to make a decision that feels right. The risks of morcellation have only recently become known and well publicized. Patients should know about the small number of patients that might have an unsuspected uterine cancer that could be spread through morcellation. No surgical procedure is without risks, but patients often choose a surgery based on a strong feeling one way or another about a risk that they would like to avoid. It is possible that some patients will choose not to have the minimally invasive hysterectomy to avoid morcellation, but others might accept this risk in order to speed their recovery. Q. Would you expect more patients to opt for the conventional open surgery? A. Possibly. Patients have generally read a lot about hysterectomy on the Internet before they come and see me. They have good questions, and I expect they will ask about morcellation. Some patients choose an abdominal hysterectomy because they feel uncomfortable with having a robot involved in their surgery. They just wanted the standard procedure of an abdominal hysterectomy.